Regular Playlist readers will know that I am a fan of classical music. Over the years, I’ve struggled with efficiently organizing what is now a 50,000-track iTunes library. Here are a few tips that may come in handy for dealing with classical music—and, in some cases, other types of music as well. The days of 128-kbps music files from download sites is becoming a distant memory. (Well, not that distant, actually; it’s only a bit less than three years since Apple started selling 256-kbps iTunes Plus files and just over two years since Amazon started selling 256-kbps MP3s.) As time has passed, not only have bit rates increased (and DRM faded away), but sites selling music in FLAC lossless audio format—especially for classical music—are becoming increasingly common. While my colleague Chris Breen and I both agree that the music file compression issue is, well, exaggerated, there are many listeners who prefer to buy music in lossless format. But most of the sites that offer music in lossless formats sell FLAC files, which iTunes does not support (in the lossless department, iTunes works with AIFF, WAV, and Apple Lossless files). It’s not that hard to get them into iTunes, though it does involve converting the files. Luckily, you can do so with several different apps, and not lose any quality in the process. Grab a copy of the free X Lossless Decoder (aka XLD), open its preferences, click the General icon, and choose Apple Lossless from the Output Format pop-up menu. Now pick where you want XLD to save the files it converts (you can even have it add them to your iTunes library or to a specific Playlist), and close the Preferences window. Next, drag the FLAC files you want to covert onto XLD’s Dock icon (you can even drag a folder), and let the program do its work. You’ll have Apple Lossless files that you can listen to in iTunes on an iPhone or iPod, or burn as an audio CD. As a bonus, the process retains any metadata with which your FLAC files were tagged. If you want to convert those files to another format—AAC, say, to save space on your iPhone—you can then do with in iTunes or with XLD. If you like lossless formats, you probably know that you can rip CDs in Apple Lossless format using iTunes. 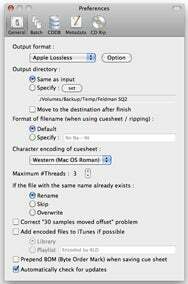 Go to the General preferences, click Import Settings, then choose Apple Lossless Encoder from the Import Using pop-up menu. But you can also use XLD to rip CDs in Apple Lossless, FLAC, or other formats. In addition, you can take advantage of certain features the program offers to make more accurate rips than iTunes. XLD checks with the AccurateRip database and rips CDs more carefully than iTunes. These features cause XLD to rip more slowly than iTunes, in most cases, but if you want a really accurate rip—similar to what Exact Audio Copydoes on Windows computers—these features will ensure that your files sound exactly like their original CDs. Note that although XLD can look up and add a CD’s metadata information when you rip, it uses a different database (freedb.org) than iTunes does (Gracenote). That means the tags might not be as good as you’d get if you ripped with iTunes. To fix that problem, read on for the next tip. Classical music fans know that tagging their music is essential to organizing, finding, and playing it. In fact, I probably spend more time tagging my classical CD rips than ripping them. In the past, I presented one of my favorite tagging tricks: a way to copy tags from the iTunes Store, which can save time when the Gracenote CDDB that iTunes checks when you rip a CD doesn’t have tags for your latest purchase, when those tags are less complete than what the iTunes Store shows, or when you’ve ripped your CDs with a different application. 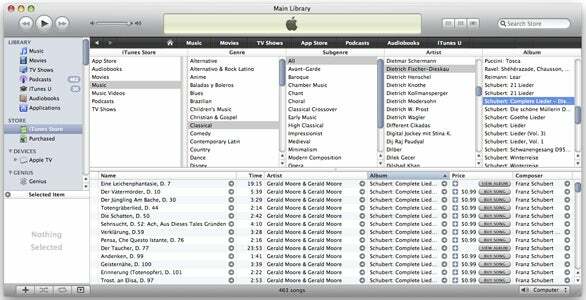 When Apple introduced iTunes 9, however, this technique no longer worked: the new iTunes Store layout doesn’t allow you to drag tracks to a playlist. Using the iTunes Store's Browse function, you can search for albums, copy their tracks to playlists, then use them to tag your own music. But there is a workaround. Check the exact name of the artist of the CD whose tags you want to copy. From the iTunes Store’s Quick Links section (at the top-right of the window), click Browse, then Music -> Classical -> All, and find the artist’s name. Find the album you want to use for tagging in the Albums column, and click on its name. The tracks will display in a list section of the iTunes window. Just select them all, drag them to a playlist, and follow the rest of the instructions in the article mentioned above.